The microwave continues to fascinate us. We began the day with a talk on how the microwave actually works. Imagine--it doesn't cwarm food by exciting the molecules neighboring the food--it excites the food's molecules (and thus raises their temperature) with electromagnetic waves! 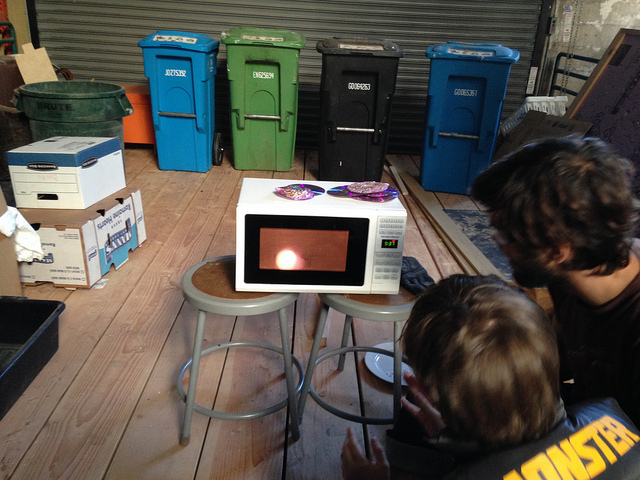 We lived the microwave manufacturer's nightmare, microwaving plastics, metals, and trying use a grape to create an arc of incredibly hot plasma. We had great fun tweaking variables (does it matter if the CD is standing vertically? What happens if you crumple tinfoil before you microwave it?) and our microwave is none the worse for the wear!